Lucy Marles (of the Jewellery Department) explains the ins and outs of buying diamond jewellery at auction. This Cartier diamond ring (FS24/194) is a good example of a circular, brilliant-cut diamond certified E colour and VS1 clarity. When buying natural diamond jewellery at auction, it is important to remember the 4Cs, which are the four main standards for judging the quality of any diamond. 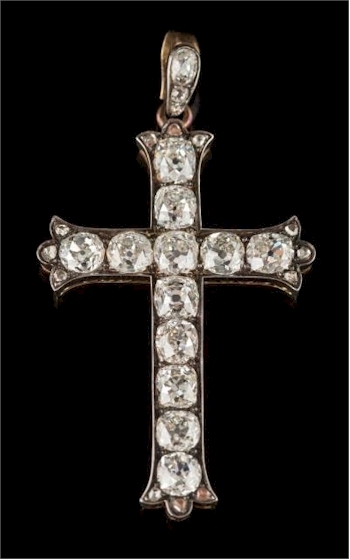 This early 19th century diamond 'cross' pendant (FS36/240) displays uniform diamonds of good colour and clarity of approximately G colour and VS clarity. A diamond cut is a style or design guide used when polishing and shaping a diamond. Each diamond cut refers to the diamonds ability to reflect light. The most popular diamond cut is the round brilliant-cut diamond that has numerous facets, resulting in exceptional brilliance. There are many other desirable cuts on the market including cushion-cut, oval-cut, marquise-cut and princess-cut. Diamonds come in a variety of colours but it is important to remember that most white diamonds often display a subtle yellow tint. The GIA colour grade scale classifies diamond colour, which is graded on a scale ranging from D (colourless) to Z (fancy colour) when grading white diamonds. Bearnes Hampton & Littlewood recommend that you select a diamond that is graded approximately H colour or above. Diamonds often display natural, internal inclusions which can impact hugely on a diamonds value depending on their position within the diamond and visibility. The GIA clarity scale ranges from 'FL' (flawless) to 'I3' (imperfect). Bearnes Hampton & Littlewood recommend that you select a diamond that is graded approximately Si/VS clarity or above. A diamonds carat weight is the measurement of how much a diamond weighs, not to be confused with the size of a diamond. One carat is equal to 0.2grams (200mg). 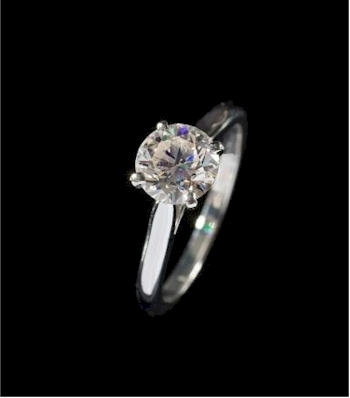 The value of a diamond can significantly increase at the full and half carat weights. 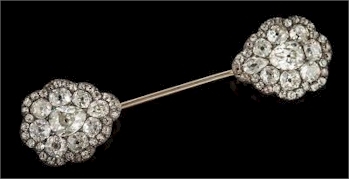 This diamond mounted jabot pin (FS37/485) displays pear shaped, cushion shaped and round old-cut diamonds of good colour and clarity. When purchasing diamond jewellery at auction, especially diamond rings, it best to ask if a certificate is provided unless already stated. A certificate documents the vital statistics of a diamond including the 4Cs. Bearnes, Hampton & Littlewood will always state if an item of jewellery is accompanied with a GIA certificate. Most diamond jewellery sold at auction is pre-worn. Therefore, it is important to carefully examine the overall quality and conditon of the diamonds and settings before making a purchase. Diamond rings, for example, will often include minor to moderate wear. Assess the quality of both the setting and the diamonds. For example, is the setting particularly worn? Do the diamonds display any obvious chips? Bearnes Hampton & Littlewood in-house jewellery specialists are able to confirm the condition of all jewellery items that may be of interest. 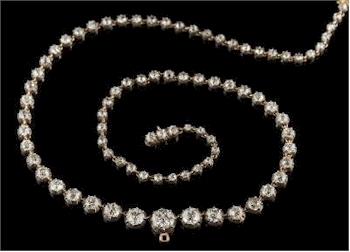 This late 19th century graduated diamond riviere necklace (FS34/348) displays high quality, old-brilliant-cut diamonds. Lucy Marles is the jewellery specialist at Bearnes Hampton & Littlewood. Lucy began working for Bearnes Hampton & Littlewood in 2011 on a part-time basis whilst learning about jewellery and the jewellery industry alongside her father Jethro Marles. Lucy now works full time as a jewellery specialist and oversees the day-to-day running of the jewellery department. Prior to working with Bearnes Hampton & Littlewood, Lucy Marles completed a secretarial diploma at her local college. From 2007, Lucy worked for many years within the beauty industry, which led her to run her own part-time business. Buying Diamond Jewellery at Auction was written on Friday, 29th March 2019.